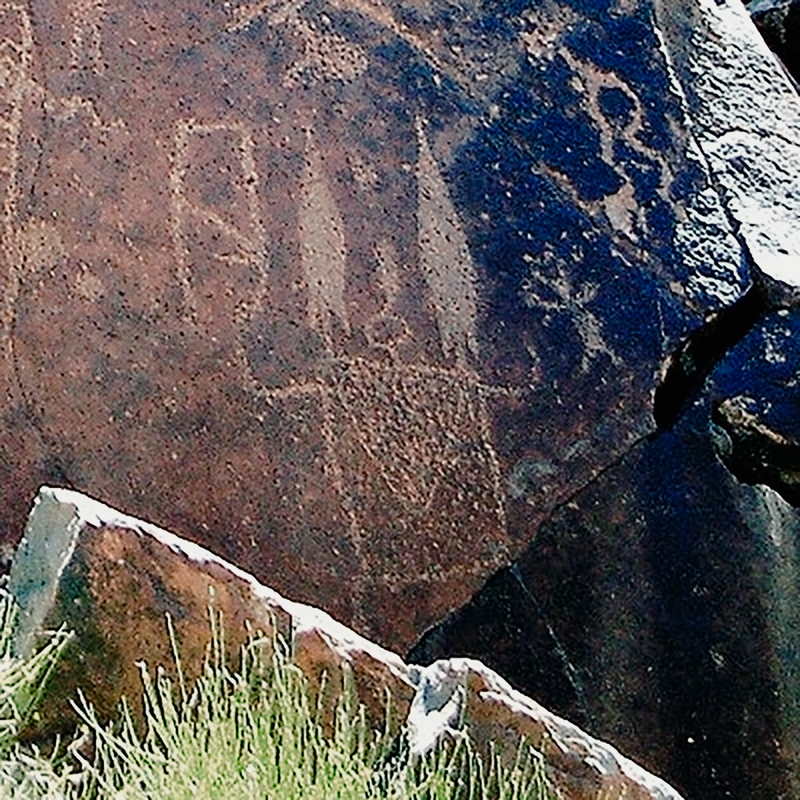 Gilreath (1999) developed a novel method to date the Coso petroglyphs. She examined 43 petroglyph sites correlating them with a restricted range of associated obsidian hydration measurements and used these chronological indicators as a temporal fix for the glyphs. Analysis suggested an abrupt decline and termination for the drawings no later than A.D. 1300 (with 94% of the 505 obsidian hydration measurements falling into earlier time spans). Research also indicated that Coso rock art is almost exclusively a pre-Marana Period (A.D. 1300-1850) expression (greater than 3.7 microns of Coso obsidian hydration measurement for lowland archaeological sites), with a distinctive Haiwee Period emphasis (A.D. 600-1300, or 3.7-4.9 microns). Single-component Coso petroglyph sites (those with a restricted range of associated obsidian hydration measurements representing a single prehistoric period) appear initially in the Mojave Period (10,000-6500 B.C. ), yet over half (n = 8 of 11) of these sites date to the Newberry and Haiwee intervals (2000 B.C-A.D. 1300). Based on a suite of nearly 100 obsidian hydration measurements for the rock art sites themselves, over half of the rim readings are grouped within the late Newberry and Haiwee periods (1000 B.C.-A.D. 1300) or 50 readings out of the sample of 96 measurements. Projectile point anthropomorph (pictured left). Analysis of projectile point types depicted in rock art panels helps date petroglyph manufacture to particular time periods. Archaeologists identified these weapons (left) as either Rose Spring or Eastgate arrow points dating from ca. AD 600-1300 or alternatively as Elko or Humboldt Series dart points dating to the period from ca. 2000 BC to AD 600. Recent independent testing of Gilreath’s dating scheme supports its general validity (Garfinkel, 2003, 2007). Evaluation of the archaeological associations of stylistically similar drawings at the Terese site (CA-KE-6188), just outside the Coso Range, provided a temporally equivalent suite of obsidian hydration measurements. Further validation of the dating scheme comes from an analysis of the projectile points depicted in Coso petroglyphs. The drawings of realistically rendered arrow points were interpreted as analogs of either Rose Spring Corner-notched or Eastgate Expanding Stem forms (Garfinkel and Pringle, 2004; cf. Murphey, 1986:86, Table 2, Area A). Garfinkel and Pringle (2004) argue that such depictions date the peak rock art production to the Haiwee interval (A.D. 600-1300) supporting Gilreath ’s position. Systematic surveys, limited excavations, and experimental x-ray fluorescence dating of the glyphs also support the position that most occupation in the Coso Range occurred during the Newberry and Haiwee eras (Garfinkel, 2007; Gilreath and Hildebrandt, 1997; Gold, 2005; Hildebrandt and Ruby, 1999, 2006:27; Lytle et al., 2006). Hence chronometric and relative dating suggests that Coso petroglyphs were not made during the last 600 years (contra Keyser and Whitley, 2006:18; Whitley, 2005). Assuming that these dates are relatively accurate, Coso style petroglyphs may have been authored by pre-Numic (aka non-Numic) rather than a Numic population (cf. Garfinkel, 2007; Gold, 2005). Late prehistoric Coso hunters may have seen a reduction in the size of the local bighorn population. This bighorn depletion might have been caused by overhunting or alternatively the bighorn herds could have been seriously affected by a loss of quality forage and watering holes caused by a protracted series of intense droughts (cf. Garfinkel et al., 2004; Grant et al., 1986; Hildebrandt and McGuire, 2002). In any event, it appears that after A.D. 1300 large game hunting was de-emphasized with respect to the subsistence pursuits of the local Natives and the Coso rock art tradition abruptly ceased (Holanda and Delacorte, 1999).